Mature Height 50 - 60 ft. Mature Width 25 - 30 ft. 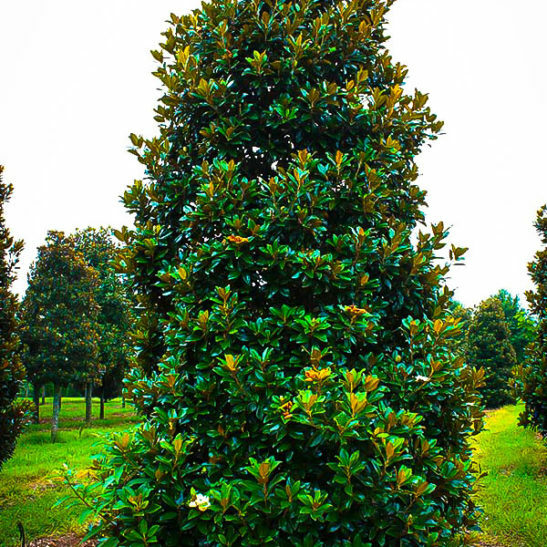 The southern magnolia is without equal among evergreen flowering trees, and the Claudia Wannamaker form is top of the list for a full-sized tree, that will begin to bloom at an early age. This vigorous tree will grow rapidly, at around 3 feet a year when young, so it will soon become a good-sized specimen, or create an excellent screen for privacy. 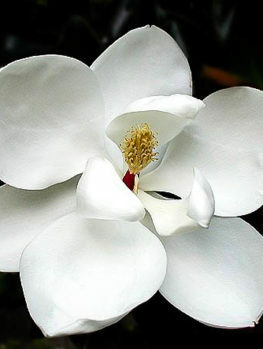 With its beautiful glossy leaves and enormous, 12 inches across pure-white perfumed flowers, this symbol of the south is a perfect choice for anyone with a larger garden living in zones 7 to 9. All summer long it will be covered with those beautiful blooms, and even out of flower it has a grand beauty, and makes a real statement in any garden. 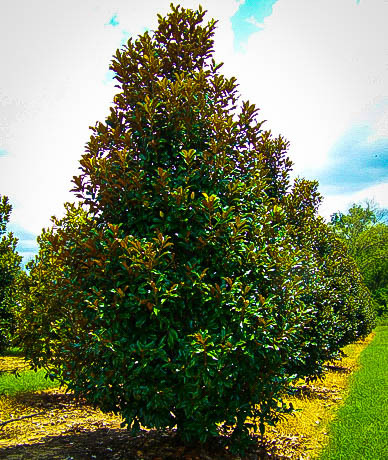 The Claudia Wannamaker Southern Magnolia grows well in any soil, from sand to clay. It thrives in ordinary garden conditions, and although it benefits from a good supply of water, once established it is drought resistant under normal conditions. It is resistant to salt-spray, deer and usually free of pests or diseases. This tree thrives in all the warmer parts of the country, and despite its majestic beauty, it is an easy to grow and fast-growing tree that you will love all year round. This long-lived tree will become a feature in your garden and you will wonder how you ever gardened without it. The southern magnolia is one of the great trees of America. With its majestic form, beautiful glossy leaves, and enormous perfumed white flowers, it is a highly desirable tree for garden specimens, and for screening. Wise gardeners have a rule, “never grow the ordinary form of a tree if a suitable cultivated form is available.” Why do they say this? Because cultivated forms are guaranteed to given us precise results. We can anticipate their size and spread accurately, know just how hardy they are, exactly what they will look like, and know that a group of them will be completely uniform and matching in appearance. Compare this to seedling trees – these are all individuals, looking a little different, growing at different rates, and varying in their resistance to cold, drought, pests and diseases. For this reason, it always pays to plant a named form, even if the cost is a little higher. 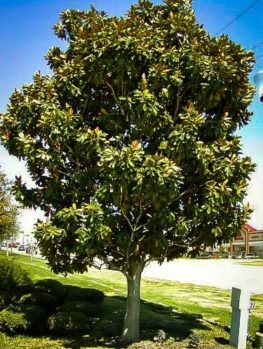 So, if you want a southern magnolia, and you want a full-sized, classic tree, choose the Claudia Wannamaker Southern Magnolia, not just any tree. This special form has a perfect upright pyramidal form, growing steadily into a tree up to 50 feet tall, and just half as wide as it is tall. It has beautiful, large, evergreen leaves, which are thick and leathery. The upper surface is a rich glossy green, and the lower surface is covered in a dense, brown ‘felt’, a pronounced characteristic of this species of magnolia. The leaves have smooth edges, and they are oval in shape, 6 to 8 inches long and 3 to 5 inches wide. All summer long, the tree will be covered in a succession of enormous pure-white blossoms, a full 12 inches across, and richly perfumed with the most wonderful scent imaginable. 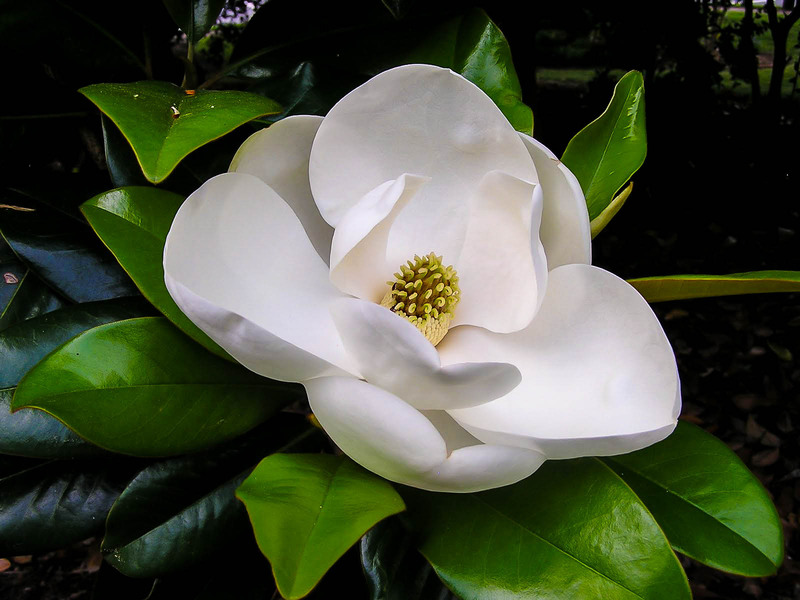 The Claudia Wannamaker Southern Magnolia begins to bloom at a much earlier age than seedling trees, or most other varieties, so it will not be long before you have blooms on your young tree. The 12 petals that form the flower are thick and substantial, pure-white in color, and the whole flower has enormous presence and grace. The petals open out almost flat, revealing the central parts of the flower, showing their large, pollen-producing stamens. In fall each flower develops a fruit, that at first glance looks a little like a pine cone. It is brown, 4 inches long and 2 inches wide. From this ‘cone’ bright red seeds are produced, briefly held on a magical silken thread, before falling to the ground. 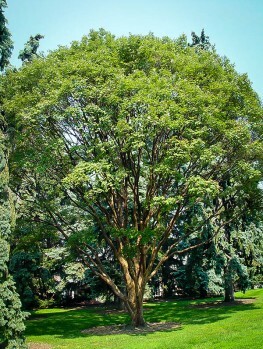 This tree is the perfect specimen for a large lawn, or for planting in prominent positions anywhere in your garden. Because of its ultimate size, be sure to allow sufficient room for your tree – it should be at least 12 to 15 feet away from a building, and do not plant too close to your property line, or a driveway or road. Because this is a selected, cultivated form, it is ideal for creating avenues of screens, since every tree is identical, so the effect will be perfectly uniform and extremely beautiful. The Claudia Wannamaker Southern Magnolia makes a spectacular privacy screen, giving you year-round privacy and protection. When young this vigorous variety will grow up to 3 feet a year, slowing to one or two feet as it becomes older, so you will soon have a substantial screen, giving you all the privacy you need. 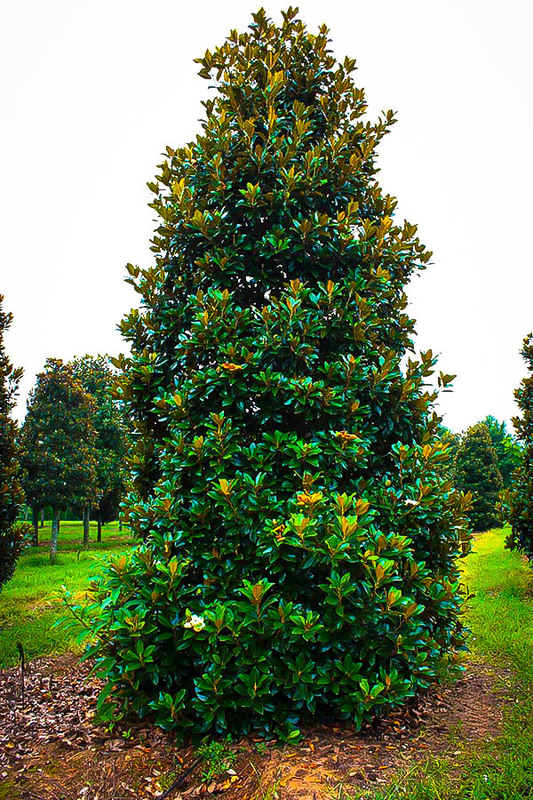 The Claudia Wannamaker Southern Magnolia is an easy, trouble-free tree to grow. Choose a sunny spot for your tree, although it will also grow well in partial shade. Some shade is beneficial for young trees if your soil is dry and you anticipate the tree having to tolerate drought conditions. It will grow in most soils, from sandy ones to clay. It does best in moister soils with a good amount of organic material in them, so add plenty when preparing your planting spot, and mulch the root-zone in spring, especially in the early years. Once established, this tree is resistant to normal drought conditions, but it will grow faster and stronger if it has a regular supply of water. It is resistant to salt-spray too, so it can be grown near the ocean, and it makes the perfect wind-break to protect your garden, allowing you to grow more salt-sensitive species behind its protective barrier. It is also normally not eaten by deer, or bothered by pests or diseases. The southern magnolia, Magnolia grandiflora, grows wild throughout the woods of North Carolina all the way to Florida, and westward to Texas. These magnificent trees have long been associated with plantations and the southern way of life, conjuring up lazy evenings and warm nights, filled with the rich perfume of its flowers. 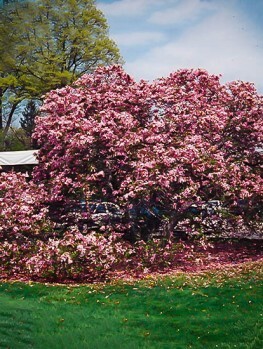 The ‘Claudia Wannamaker’ variety was developed at Shady Grove Plantation & Nursery, in Orangeburg, South Carolina. This 600-acre, wholesale nursery specializes in planting large trees, and it was established in 1939 by John Brailsford. 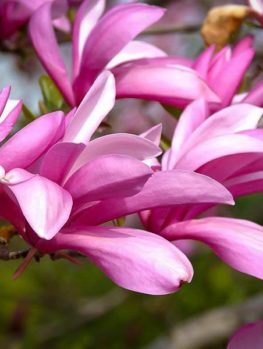 He developed ‘Claudia Wannamaker’ to create a larger form of the southern magnolia that would bloom when still young, and had a strong pyramidal and upright habit. This is one of the very best full-sized varieties of this tree available. 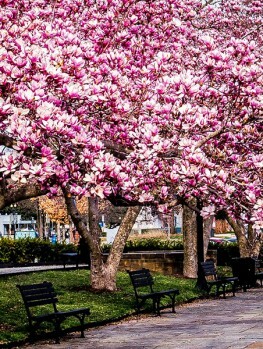 Avoid cheaper trees, that are unpredictable in form and final size, and can take many years to begin blooming. We are pleased to have secured a good supply of this spectacular tree, but we know how sought-after this variety is, so we do not expect to have trees in stock for very long. 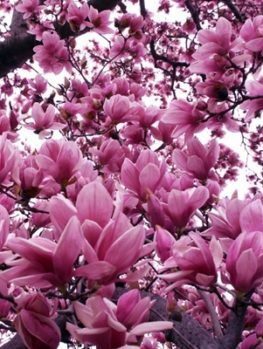 To enjoy the perfect southern magnolia for decades to come, order now, or you may easily be disappointed.